We have assumed for too long that just because we have been saved that we are automatically “disciples.” That is our mistake. As the saved church of Christ – His body, His bride, His beloved sons and daughters – we are called to be disciples, but not every one of us who is saved answers that call. A second reason we don’t answer the call is because we think it is too difficult. A narrow path and filled with many trials it is. (Did that just sound like Yoda?) Personally I’d rather walk the narrow path, where my guide is Jesus himself, than walk the easy path, where my guide only has one thing on his mind – my destruction. The original BIG XII understood that Jesus was calling them to “embrace and assist in spreading his teachings.” He was called Teacher by Peter in Mark 9:5. Even Pharisees called Jesus teacher. (Mark 12:13-14) (John 3:2) The disciples embraced Jesus’ teachings. And as far as the second qualification for a disciple – as assisting in the spreading of Jesus’ teachings – Jesus let them know, from the beginning, that this was why he’d called them. Mark 1:17 “And Jesus said to them, “Follow me, and I will make you become fishers of men.” And that is exactly what they became. In fact, the original XII – minus Judas – died because they would not stop spreading the teachings of Jesus. These are the men who, along with Paul, penned the New Testament. These are the disciples God is calling us to join. 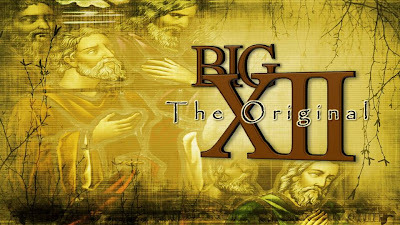 This is the original BIG XII whose examples we are invited to follow. Of all the things the modern church needs to stop procrastinating with, it’s forgiveness! Christ DIED for FORGIVENESS! Some friends brought a paralytic to Jesus and what was the first thing he said? “Take heart my son, your sins are forgiven.” We live forgiven lives, because of Jesus death – His blood shed for the forgiveness of our sin. Do we hold his death in contempt when we withhold forgiveness from others? Sunday we dealt with this issue of forgiveness. Not one of us can escape. We all need to forgive. We MUST! No evil could be done to us that cannot be forgiven. Yet, because we’ve been hurt, we will hold on to a grudge or a conflict because it helps us justify our pain. There are couple tricks our enemy likes to use to encourage us down a path of unforgiveness. We can hold it over their head. – Somehow we have allowed ourselves to be convinced that withholding forgiveness gives us power over the person who hurt us. That is a Lie! An unforgiving heart is not empowered, It’s imprisoned! Withholding forgiveness legitimizes my hurt. – No. It doesn’t. It only lengthens your hurt. They should suffer for what they did to me. – Ummm, I don’t know how to tell you this, but… They probably haven’t given it another thought. How much time have you wasted meditating on their crime and your pain? As we entered the service yesterday each of us was given a rock. We were to hold that rock throughout the service. Awkward doesn’t begin to describe it. Hindered, restricted, annoyed also fit the bill. I had to put it in my pocket and it rubbed my leg as I tried to worship. I attempted to focus on God, but my mind kept returning to the rock rubbing a raw spot against my leg. When I sat down I took it out and held it in my hand. My leg was relieved by now I only had one hand free to follow along in my YouVersion bible app. I was afraid I would scratch my iPad with the rock. I couldn’t hold my wife’s hand, which we sometimes do while sitting together in church. The rock came between us. Finally, when I got up to sing the song of response, I let it go, laid the rock down at the alter. I’d held it long enough that I could describe it in detail. I could go back later and among all the rocks, I could tell you which one was mine. The thought came to me after the final song to go back and pick it up. THAT would have been a mistake. I would not have wanted to answer the question later. Father, help me to forgive as you did. The same death you died on the cross for me is given to the ones who have hurt me. I have no room to stand and judge anyone. Thank you for forgiving me. I celebrate your forgiveness and pass it on to those whom I need to forgive. Where do you stand on the subject of forgiveness? Have you been restored after a broken relationship? Is there anyone from whom you are still withholding forgiveness? Please leave a comment below. I have found myself inspired by this question. For 2 months I’ve prepared for the campaign and in my review of the studies, I recognized how often I take this life for granted. Days pass and weeks, where I put off the things that matter most, in the name of working harder. It seems valiant sometimes for ministers to sacrifice for the sake of their churches. Some churches have even come to expect it, having become accustomed to pastors who have given more than should be expected. But this blog isn’t about churches expectations on pastors. It’s about pastors unrealistic expectations on themselves. Or, to be more specific, this pastor of worship’s unrealistic expectations on himself. I’ll say upfront that I’m much better than I used to be. There was a time when I felt guilty when taking a vacation. If I sat down to read a fiction novel I would get a pain in my gut because I wasn’t using my time to study. It was difficult for me to enjoy my time with my kids, though I loved them very much. During this time I poured myself into my job and wrongfully looked for approval from the church I served only to be disappointed over and over again. I hid my disappointments from my wife and glued a fake smile on my face for my kids. This robbed Mel of the calling God had given her – supporting a husband in ministry. Being robbed of the opportunity to fulfill one of her callings was discouraging to her and made our marriage strain. My kids, I’m sure saw me more as worship pastor than as dad, and that is a mistake I can never undo. My upside-down paradigm of leadership (work harder, longer – neglect family and self) also lead to professional frustration. I’m sure that most of my failings came not from lack of work, but rather from a lack of balance. It is not possible to be successful in ministry following a set of rules that are out of balance with God’s grace. No one on their death bed ever says “I wish I would have made more money.” or “I wish I would have spent more hours at work and less with family.” On the contrary, more regret spending so little time with family or regret the selfishness of their lives. Ty Cobb, who achieved wealth and fame said this at the end of his life; “I wish I had more friends.” only 3 baseball players attended his funeral in 1961. God has, more than once, brought it to my attention that, most of the time, I’m not the father, husband or Christ follower that I should be. Jesus died so that my life would be more than this. Why have I allowed status quo? Why have I bought into the “do more/try harder” nomenclature? Father, help me stand secure in your grace. It is enough. My pride and insecurity lead me down a path of guilt. I feel guilty when I don’t produce the result I think I should, but you have simply called me to be faithful. I trust you for results that fit your plans. I will be faithful. I become defensive when I look to satisfy my insecurity with achievement or adulation from others. Help me to find all the security I need at the foot of your cross. It is enough. Help me to be humble enough to forgive others and courageous enough to seek forgiveness. What does it mean to you do “Live Like You Were Dying?” In what ways do you want to see more of Jesus in the way you live? Please leave comments below. I think my eyes are in backwards and all I can see right now is myself. I’m blind to the needs of others around me. To me, they don’t even exist. All I can see are my needs. It doesn’t seem to be hurting me, but if it does, I think I’ll have to do something about it. I was talking with a friend the other day who was asking for prayer and advice regarding some tribulation that had come his way. I thought about his story and it reminded me of something similar that had happened to me. Well, maybe it wasn’t exactly the same as what happened to me… come to think of it what happened to me had nothing at all to do with my friend’s situation, but I told it to him anyway. We both had a good laugh, but he seemed to go away sad. It was hard to tell, because all I could see was me. I think my eyes were put in backward. This morning at my accountability group prayer time we each asked for prayer, but when we prayed I noticed no one was praying for the requests I had made. Maybe they just didn’t think they were that important. I know, I’ll bet they just didn’t know what I meant when I said “unspoken.” On my turn I was very careful to name the person Luke had asked for. You know, his friend who had cancer… or was it kidney disease? No, I remember, it was a hemorrhoid… no, no that’s not it either. But I prayed for him by name, or was it her? Come to think of it, it wasn’t his friend, it was his sister, Jill, I mean, Joanne… I can’t remember. I’ll have to ask him later. I think I just prayed for “Luke’s request”. God knew what I meant. I’ve gotta get my eyes fixed! My ministry team meets tomorrow. I can’t wait to share all my ideas. They are going to love them, and if they don’t I’ll just join another team. I mean, if they didn’t want to do it my way, then why did they ask me to be on the team? They better not “tweak” my ideas either. I know God gave these ideas to ME, and it must be because He wants them done the way I would do them. Why else would He give me the idea in the first place? My favorite radio station wasn’t coming through very well today so I tried out a couple other so called “Christian” stations. I couldn’t stand this one station. No matter how low I turned my volume down in the car, the music still sounded too loud. I didn’t like it. This music can’t be honoring to God, can it? I’m just sure that God doesn’t like that kind of music. It’s too grindy. God doesn’t like grindy music. At least not my god! My eyes are still in backwards. I’m going to have to get that checked out. It doesn’t seem to be affecting my daily life, however, so perhaps I’ll put it off. Like I always say- if it ain’t broke, don’t fix it. No one prayed for me today.I’ve heard it said and said it myself – “I could feel your prayers.” But I didn’t feel anyone pray for me today.I walked through my day and so many things went wrong.I lost my keys in the morning and was late for work.Was anyone praying for me?I spilled my coffee in my car and ran out of napkins before I could clean it up.Someone please pray for me!Upon entering my office I was bombarded by messages and problems that I had to fix.Why won’t someone pray for me?Rushing back after lunch I slammed my breaks on but still rear-ended the car in front of me.I could really use some prayer! Why won’t anybody pray for me?I’m a member of my church and they know me.Are they praying for me?My family raised me to follow Christ.Are they praying for me? I ended my day on my knees and realized it was the first time today I had taken that position.Holy Spirit began to convict me that I had not prayed for anyone today.I had only been thinking of myself.Had I started the day in prayer and continued in a spirit of prayer throughout the day, perhaps I would have been less self absorbed. If I had been a person humbled to pray, Christ would have been my focus and not me.I realized then that the Bible says that Christ is interceding for each of us.That means, in a sense that He is praying for us.He had been praying for me throughout my troubled day. From now on when I don’t “feel” the prayers of others on my behalf, I will stop and pray for others.I will remember that Jesus is interceding for me and he is watching me.